This entry was posted on March 21, 2016 at 2:34 pm and is filed under Advertising, Branding, Censorship, Communications, Ethics, Motivation, Passion, Positivity. You can follow any responses to this entry through the RSS 2.0 feed. You can leave a response, or trackback from your own site. Seems a bit silly to me. Doesn’t it stay within the advertising rules? I’m of a similar mind to you in that RTE should let the advertising standards agency make the decision on whether ads should be allowed. Good ad though – well done Brendan! Greg, I’m happy to read Conor’s advert was banned by RTE. I fail to see how the drinks brands are “working really hard to get it right”. If drinks companies (ie Diageo) are genuinely promoting responsible drinking why not sever their ties to Irish athletics? And if selflessly interested in promoting the idea of dreaming big, why not run Conor’s ad on RTE without the link to Budweiser? Its not as if they can’t afford to do that? Great to see an opposing view Caroline. Conor is a high profile athlete who has been very successful, which is why the inspirational message about ‘Dreaming Big’ works. Why would you want them to sever their ties to athletics – surely sport is a good thing and their sponsorship means more income for the sport? Your point about advertising and not mentioning your brand name ….hmmm, good luck with that one! Did he obtain his success by boozing? Can we not find better advertising for sport than companies that specialise in feeding mental and physical ill-health problems in our country and whose ubiquity serves only to patronise and torment those dealing with its aftermath? The fact that “drink alcohol responsibly” languishes on the bottom of the screen says it all, really. Same as Gambler’s Anonymous leaflets tucked nicely out of sight at a Paddy Power. Thanks Mike …I think you are on the side of banning alcohol, let alone banning alcohol advertising? Thanks for your input. Not in the least. Grown adults can (and should) do whatever they please, as long it doesn’t hurt others or break any laws. Would just like to see these companies take responsibility with their campaigns. Kids are seeing these ads and equating achievement with the cheap cans in Centra, for some tied in with children’s allowance day. Grossly irresponsible. Thanks Mike – I worked in the industry before and can see a huge difference in how it has changed when it comes to promoting it’s brands and I genuinely don’t see a brand being irresponsible in any way here. You will never see an advert for the cheap cans in Centra and brands will run a mile from anything like that. 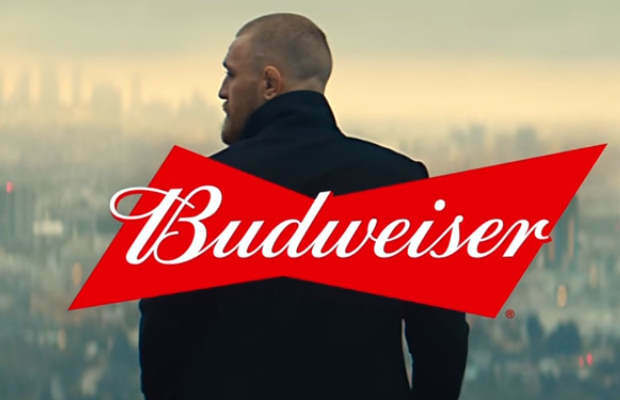 Doesn’t matter what the industry runs away from – the kids see the big Bud logo after Conor McGregor speechifies and then see it on the slabs at home or in the pub when trying to bring Dad home. The alcohol companies aren’t even trying to be responsible – if they were, they’d surely knock below-cost selling on the head and raise prices in pubs to inhibit binging? No,Greg if we take their perspective it removes personal responsibility from life. It is always someone else’s fault that little Liam or Mary drinks or decides to be a wanton trollop. That someone else can dictate the course of ones existence with a mere hint. Unless, that Conor bloke is coming to your house and punching you in the face until you drink that advert is meaningless. People who think as the above are simply cowards. They look outside themeselves for blame and even for hope. Thanks Jenny …. I am in your camp. I think the advert (and the campaign that runs alongside it) was a very positive one and I loved seeing seeing a brand promoting a positive sentiment. I don’t get the downside. Conor McGregor is a hero to many in Ireland and across the world. He has worked hard and now he is being rewarded by one of the most powerful brands in the world. Budweiser does not hand out money for no reason, it is not a charity after all. The very fact that you say (Greg) that you do not even see the Bud logo until the end of the ad speaks volumes for just how clever the alcohol industry is in this country. This ad is not about Conor McGregor, it is about building a very clever association between a very successful and much worshiped athlete and their brand, i.e. Budweiser. So the seed is planted in the minds of the young from such a formative age that to be successful and to fit in you need to drink alcohol. I would certainly not consider myself to be a conservative, but I totally endore RTÉ’s right to ban this ad, as I think it works on a level that has not be analysed in this discussion so far. It is about linking alcohol with a sports star that is admired by kids as young as 8, 9 and 10 years of age. Surely as the country is awash with problems that directly stem from alcohol, like the smoking ban, surely we want to give this next generation the right to chose for themselves and not have rich multi-national firms manipulate their choice for them by utilising sports stars. However, you are totally correct by stating that the message of the ad is great – and that shows you how clever the ad is. If this was a health promotion ad, or an anti-depression ad for young people I would give it an award, but as it is selling alcohol with such a positive spin, I think it is under-hand and that it was 100% correct to ban it. Thanks for the interesting perspective Pyers – until I see other brands investing in such a positive message I’ll applaud Budweiser and hope that it turns out to be positive. If we take Pyer’s perspective on alcohol advertising is there any form of advertising they should be allowed to do?